Disclaimer: other than the handwriting, I can’t really take full credit for any of this. I found all my inspirations from Pinterest. I’m not selling or profiting off of any of it so I’m pretty sure copying is ok here (I’m definitely not here to plagiarize). 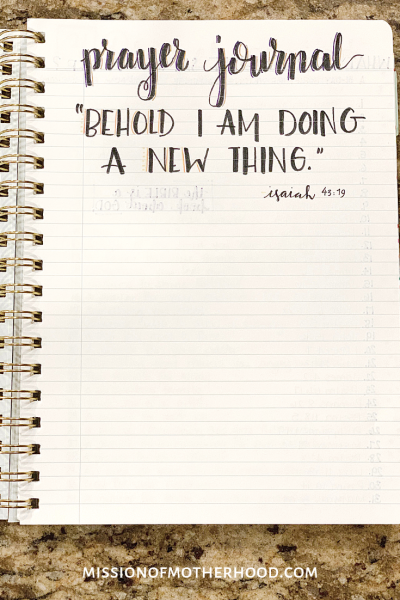 I created a board for prayer journaling, though, so if you’re interested in seeing my pinspirations, check it out. 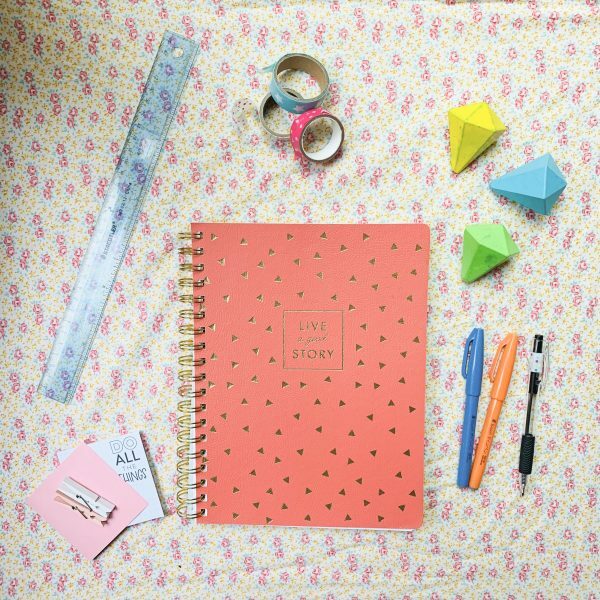 The first thing I did was find a fun notebook with an inspiring “go get em” message on the front, like this one: “Live A Good Story.” I picked one that is a good size and weight, with soft, smooth paper, and skinny lines. 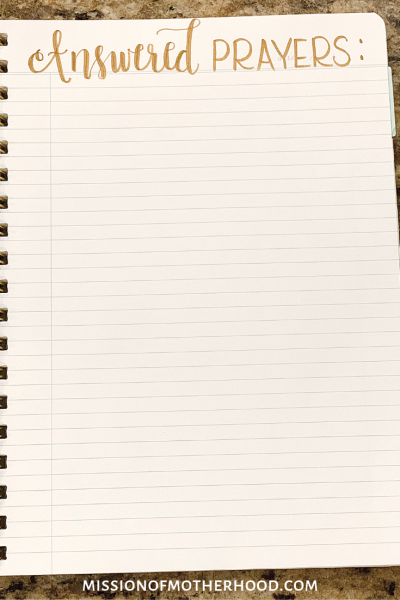 I am not normal…I’m very particular about which pens I like to use on which paper and the size of my lines, but if you’re normal then any notebook will do. I lucked out with mine from TJMaxx, and I’m extra excited about the fact that each page has a place for the date. Just inside the front cover, I doodled “prayer journal” and a verse that I thought was fitting for a new thing (not a new year’s resolution, per se, but a good goal): Isaiah 43:19. Who starts their real work on page 1?! No one, I always leave blank or title page for things like this. I never jump right in to the good stuff! 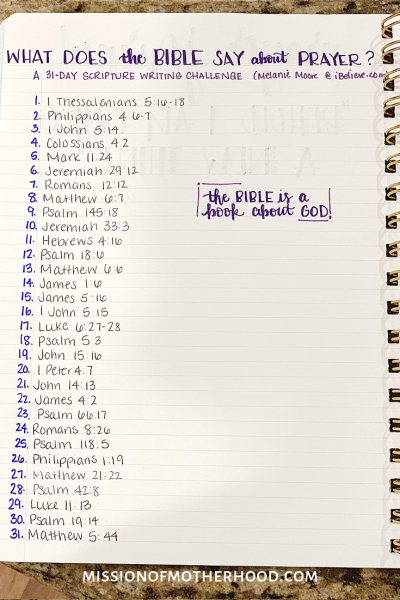 Page 2 – What Does the Bible Say About Prayer? 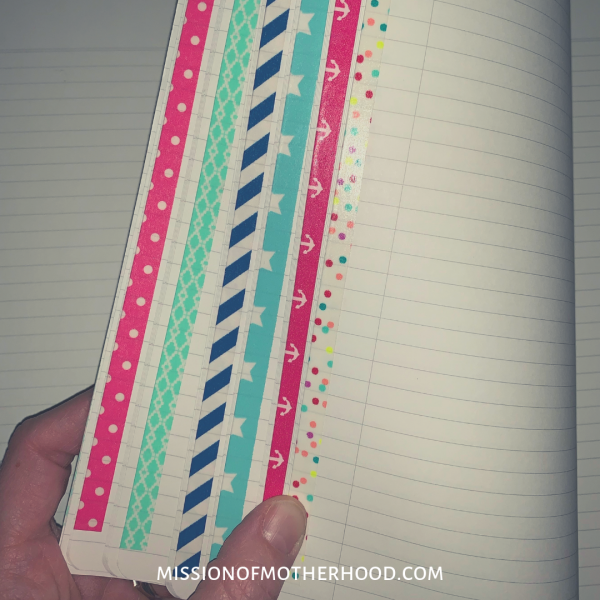 On page 2, I found a 31-day Scripture writing challenge. Fun doodles + 31 line items = perfection (truly, I could not have planned that better had I tried). At this point I decided to make each page a “color theme,” because who doesn’t love color? 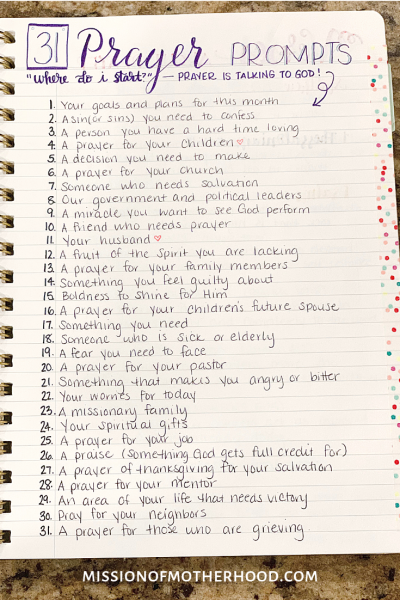 My goal was to use this for inspiration in praying Scripture or memorizing verses if I felt like I “don’t know what to pray for” on any given day. On page 4 I doodled Verses about Prayer before I realized that some of the ones I was going to write were already on page 2. Ah, well. 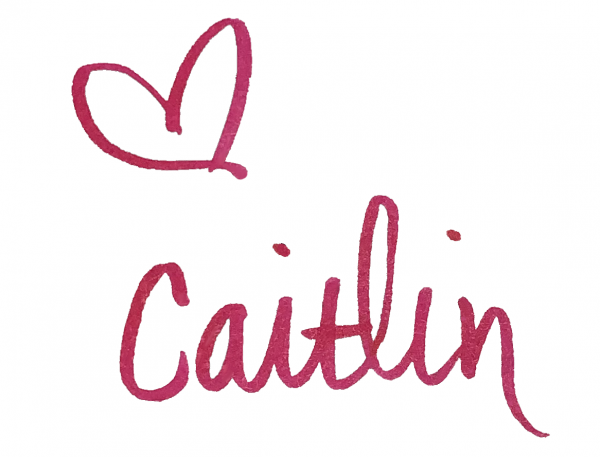 It’s still good hand-lettering practice, and a chance to write out my favorites or some memory verses. 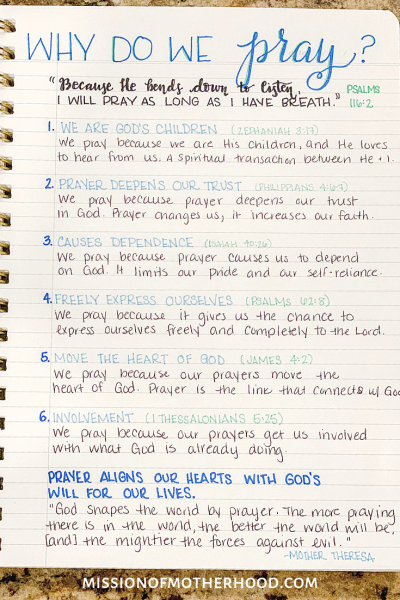 Page 5 – Why Do We Pray? 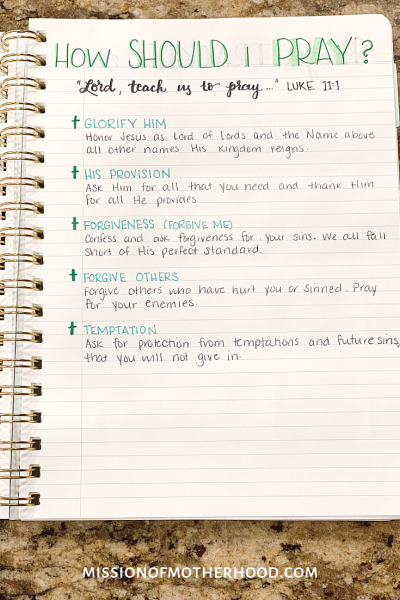 Page 7 – How Should I Pray? I skipped page 6! Why? No idea, but it’s blank, so maybe I’ll find something fun to put there later. Page 7 is titled ‘How Should I Pray?’ and I used some more pinspiration to write out a response. I just love the thought of the disciples asking Jesus to teach them to pray, even though prayer wasn’t a new concept for them. Page 8 is my tracker! 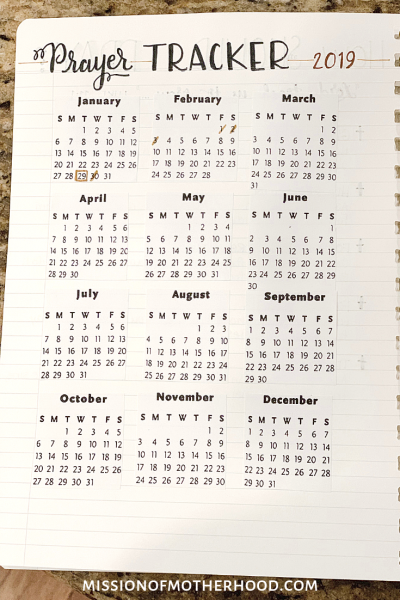 I happened to have a magnet on my fridge with a small version of all 12 months of 2019, so I copied it and enlarged it 200% and then cut each month out and glued them in place. I lucked out that this notebook paper + glue stick did not = wrinkly mess. 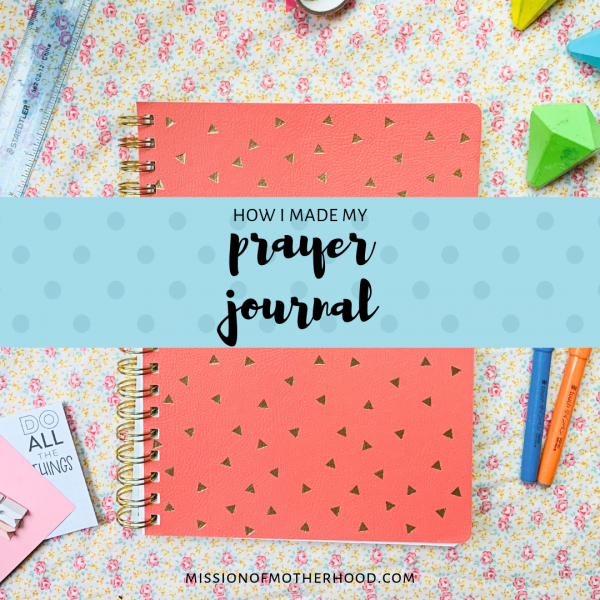 My plan here was to keep a visual record for myself of which days I intentionally prayed, and the point of journaling each prayer was to avoid that drive-by prayer I mentioned above just to tick a box. When I took these pictures last Monday I’d already skipped a day, but thankfully I haven’t missed since, and it’s already been another week! 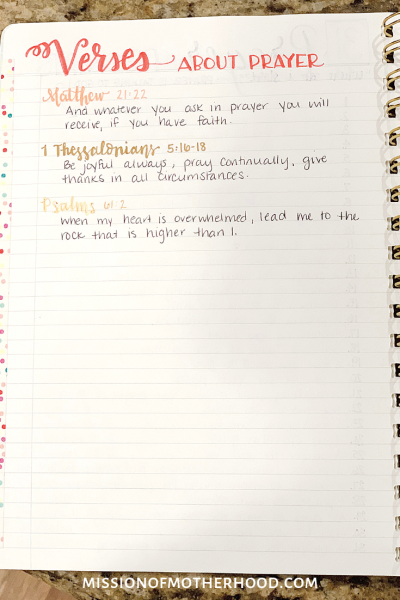 On page 9 I doodled Answered Prayers because I love the idea of being able to go back and SEE reminders of when God specifically answered a prayer. Yes I know, He won’t answer them all, and I know sometimes (often times) prayer changes us and not our circumstances (anyone else singing Garth Brooks in their heads right now? ), but I still love the visual. In low times, it’s nice to have a list of things to praise Him for; things He has done and prayers He has answered. Right now it’s empty but I’ve got 3 I need to add, and maybe if I fill it up I can use page 6 for more Answered Prayers! That’s all I have for right now as far as fancy pages go. 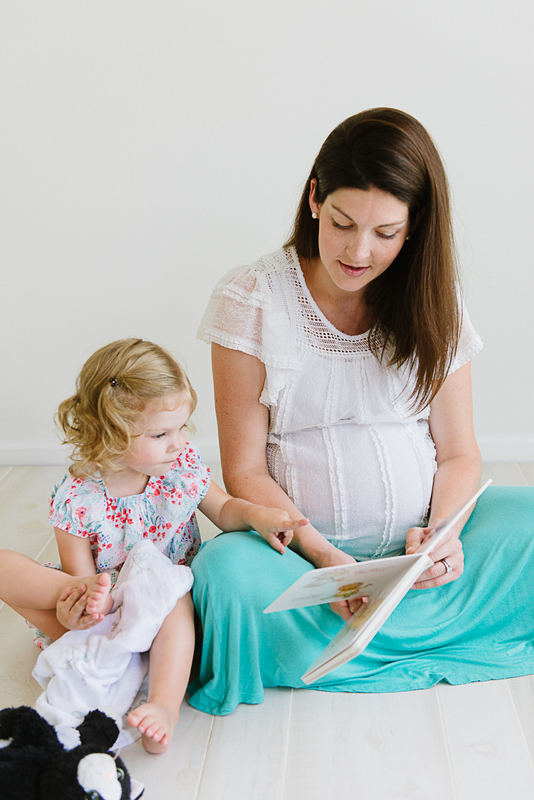 The bulk of the book was designed for content. Every 5 pages for the first, I don’t know, 30 pages, I put a strip of fun colored washi tape along the edges. Originally I had intended to make a ‘tab’ for each person in my family, or a tab each for family/friends/church/life/etc, but that seemed too crazy for me. I have little people and I needed it to be simple. So while they’re not tabs, they make the notebook pretty from the outside, and fun to flip through, so that’s a win! And there you have it! Fun, simple, cheap, and hopefully motivating as far as getting my Prayer Game on. How about you–any tried and true methods for keeping track of prayers? Yes/no? Why or why not?